The OG system (Oxygen Converter Gas Recovery System) is suppressed type LD gas recovery system for the converters of steel makings shops. 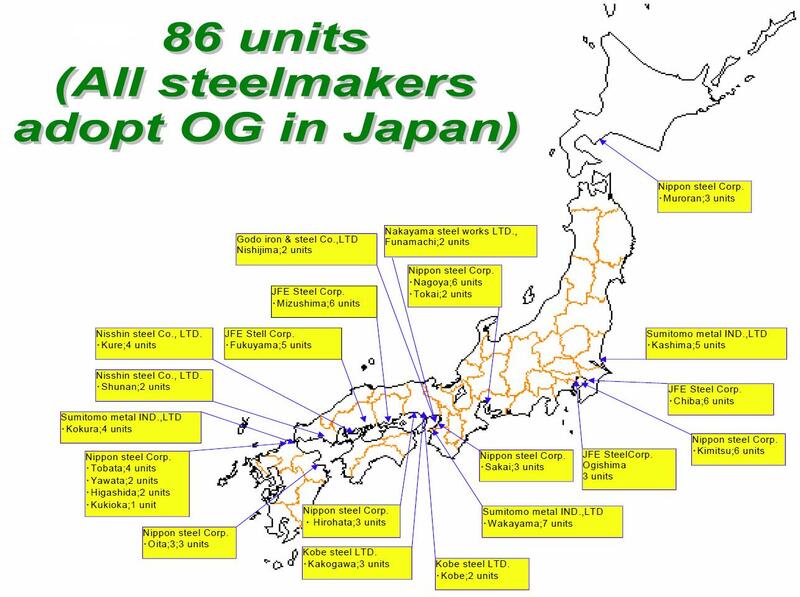 The OG system was jointly developed and improved by both Nippon Steel Corporation (NSC/ now NSSC) and Kawasaki Heavy Industries Ltd. (KHI), in Japan. In 2004, steel plant division of KHI was transferred to JP Steel Plantech, Co (SPCO). Therefore, SPCO and NSC have developed the technologies and own the patents of the OG system. Until now, totally 192 OG systems have been installed in all over the world, thus the name of “OG” is widely admitted not only as the safest process for recovering LD gas with high efficiency but also as a synonym of the best solution for energy saving and environmental control. The Hood pressure contol system of OG can ensure to suppress combustion rate of LD gas down to 5 -10%, by automatic control of the Ring Slit Washer (RSW) being also fucntioned as key part(s) of the Dust collecting system of OG. 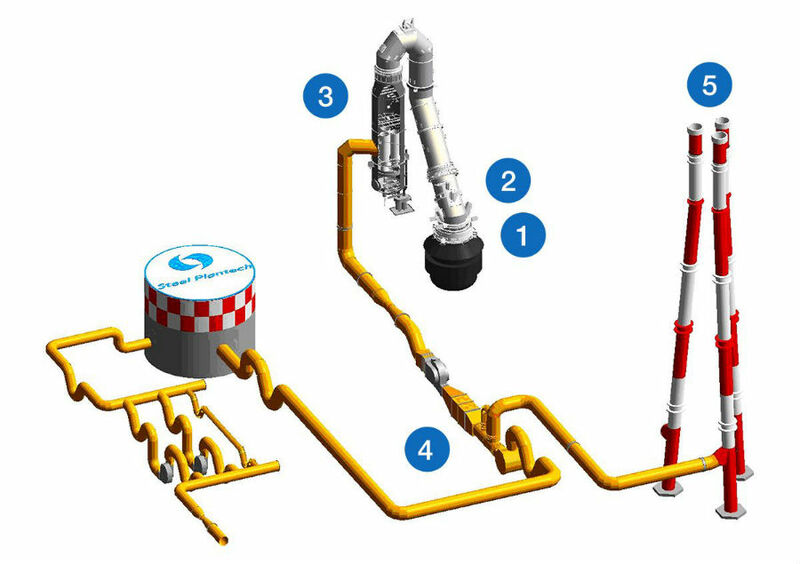 This system leads to minimize LD-gas flow rate throughout converter’s operations, that surely makes it possible to get much more compact facilities compared with the system of full-combustion type. Therefore, the key components such as IDFan, pumps can also be minimized so that cost-saving can be certainly achieved more in terms not only of their initial investment but also of their electrical power consumption. 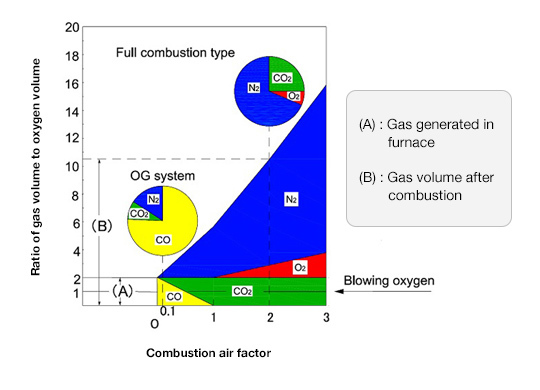 The compact facility of OG system featuring suppressed combustion type ensures you to provide more flexible design, compared with others of full-comnustion type. The compact facility and its high-flexibility of design of OG surely can correspond to any site-condition fully well enough for your needs especially for revamping projects. 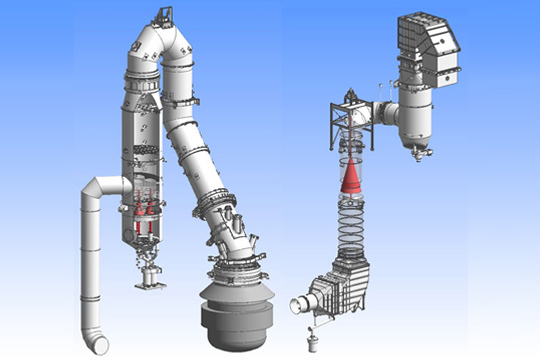 1The venturi scrubber-type Ring Slit Washer (RSW), being as the key part(s) of the 2nd stage dust collecting system of OG, allows superior dust collection efficiency to be maintained even when amount of LD-gas fluctuates during blowing. 2All the inside surfaces of Gas duct of OG keeps fully-wet as always so that there is no iginition source at all, that surely ensure you to keep positive safety throughout converter’s operations. 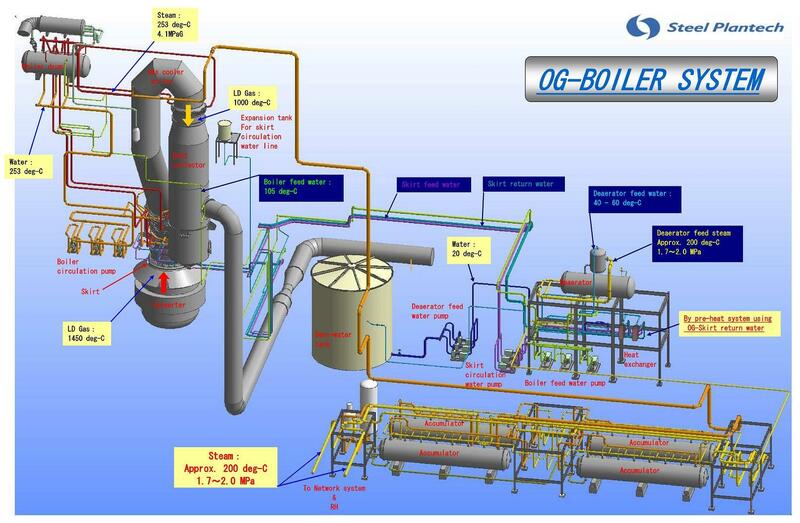 3Not only LD-gas recovery with high density of CO, steam generation by boiler system can be simultaneously achieved by OG. Also our unique technologies of installing convection heat transfer part(s) additionally can give you more amount of steam. The exhaust gas discharged from the converter furnace is the gas of high temperature (1,450°C) containing high concentration of CO (95%). 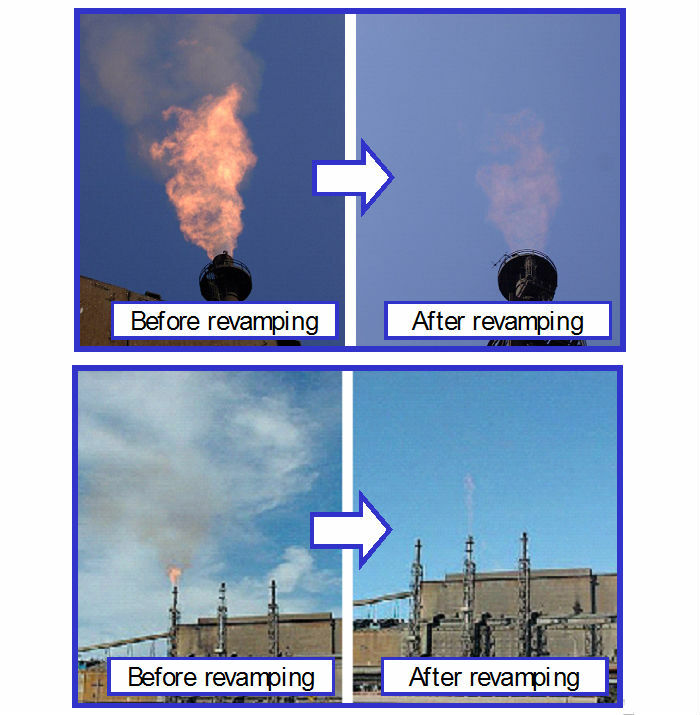 The OG unit is an oxygen converter gas treatment system which is designed for the purpose of cooling this exhaust gas by burning it as little as possible, removing the dust contained in the exhaust gas at high concentration and recovering the gas as CO gas which can be used as fuel. The combustion of the CO gas generated by the converter furnace is lowered to 10% or less by the hood pressure control system. The high temperature (1,450°C) CO gas is cooled down to approximately 600°C to 1,000°C by the cooling system. If the cooling system is changed to the boiler type, the sensible heat of the high temperature gas can be recovered as steam.. The steam recovery amount can be further increased by introducing the convection heat transfer area to boiler. The gas cooled by the cooling system is further cooled to approximately 70°C by the wet dust collector and 99.9% of the high concentration dust in the gas is removed. The high concentration (70 to 80%) CO gas which was cooled and treated for the dust removal is stored in the gas holder and used as fuel, etc. 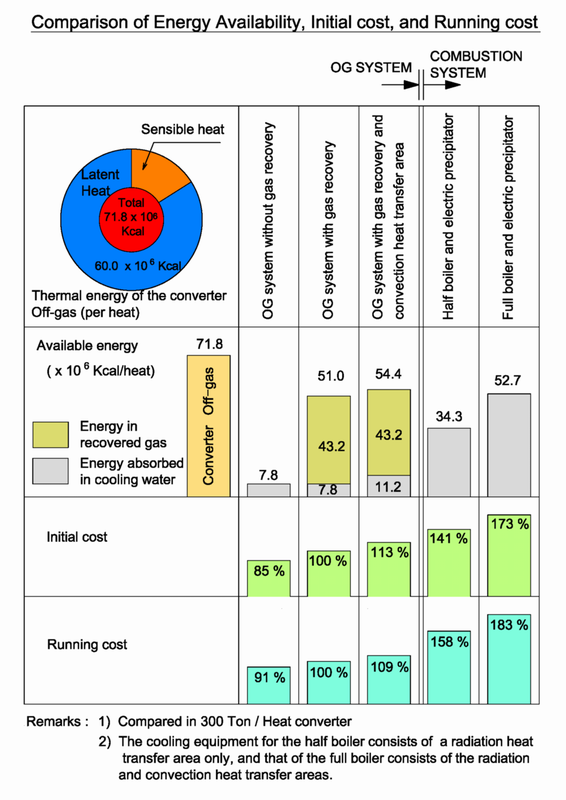 The gas recovery rate is 70% to 90%.